A group called “Naked Turtle Island”? We welcome you to meet another “new world”… The Alkdo comprise Yoshiki, who is the leader, and Takemai who is the member. Yes, “the member”. This minimal-sized acoustic band perform both in Japan and overseas from their base in Toyota-shi, Aichi prefecture. 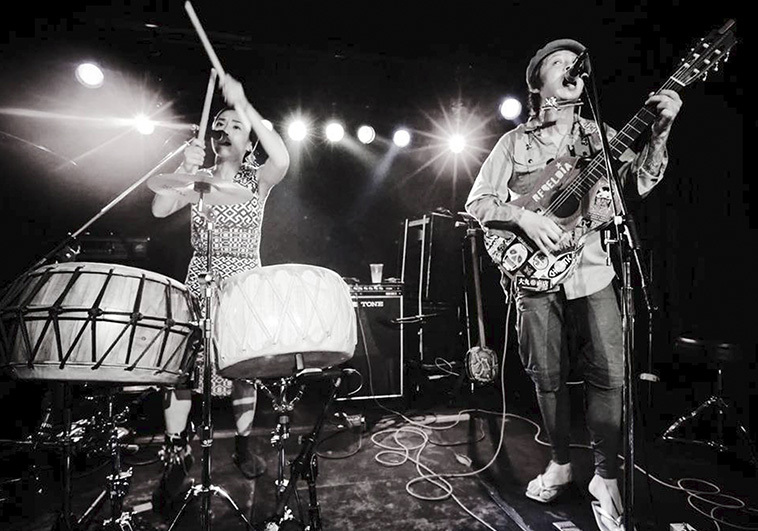 They bring their own interpretation to folk music from around the world (especially if the music is related to turtles…) As well as the guitar and the ukulele, Alkdo use the large “Sanxian” version of the well-known three-stringed shamisen and the double-sided Korean-inspired “Buk” drum. With an amoeba-like ability to adapt to their enviroment, they even organise their own annual “Under The Bridge” festival… Oh, did we mention the turtles?